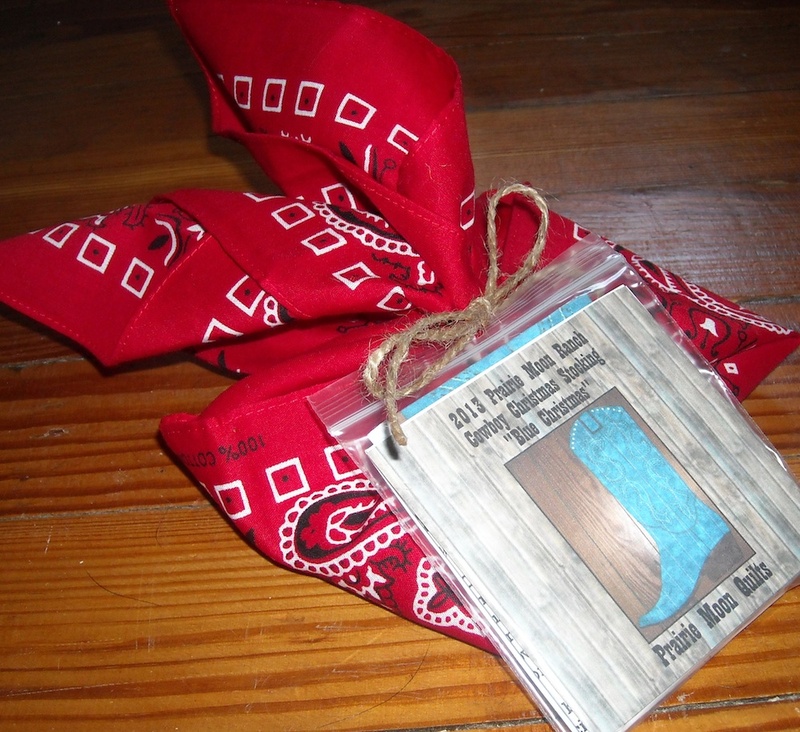 I’m very excited to announce that the 2013 Prairie Moon Ranch Cowboy Christmas Stocking is finally here! Woohoo! 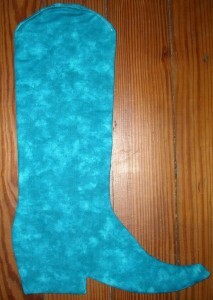 This year’s stocking is named “Blue Christmas”. 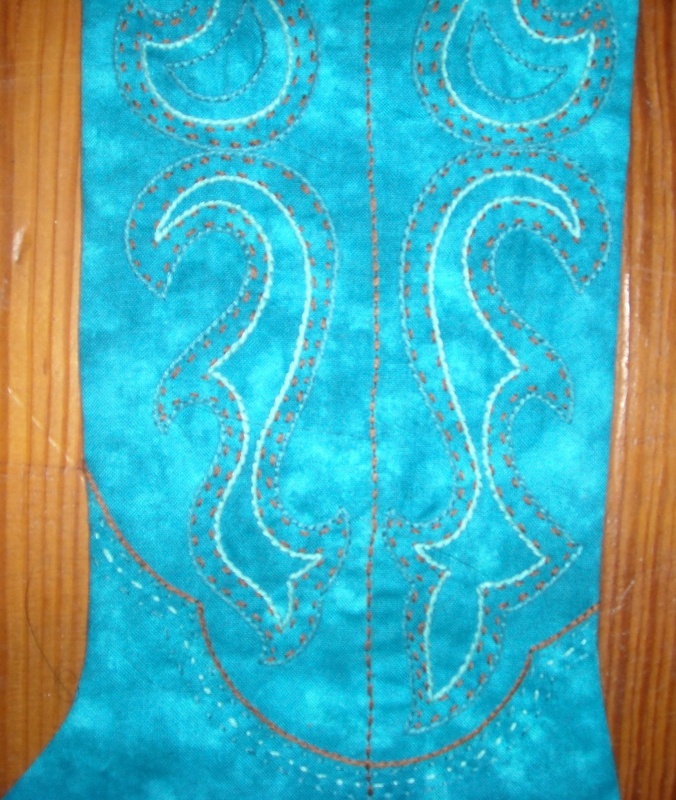 With very little applique, the embroidery is what takes center stage on this year’s stocking. So if you like stitchery, this is your year! The pattern is available in both the printed and the PDF version, as usual (in my Etsy shop). And . . . for a limited time, I’ll have some kits available that contain all the ingredients to make the stocking exactly as shown. But I’ll warn you: if you want a kit, act fast, because they disappear in a hurry, and when they’re gone, they’re gone! To celebrate its arrival, I’m having a give-away right here, right now. 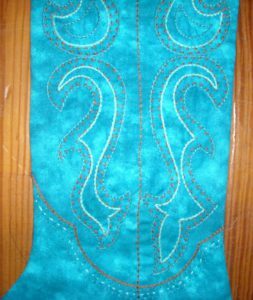 If you’d like a chance to win a copy of the newest stocking pattern, simply leave a comment on this post, telling me which of the yearly stockings is your favorite. I’ll draw for 2 winners on Friday afternoon (the 13th) — yes, that’s intentional, because I happen to believe that 13 is a lucky number! Haha! 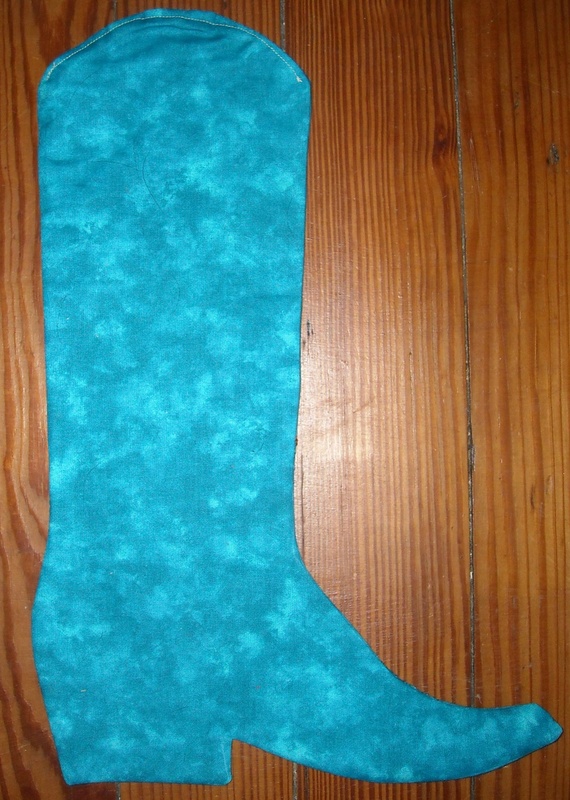 Also, for a limited time, I’m offering a bundled option for the Christmas Stocking patterns. You can buy 3 of the patterns, and get a 4th one free. Just check out the deal in my Etsy shop. It’s a great way to collect them all at a discount! 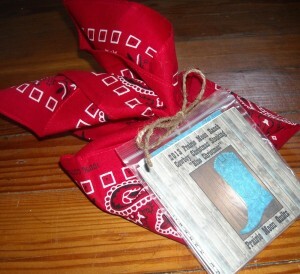 UPDATE: The winners of the free patterns are: Mary and Libby. Congratulations, gals! They are all cute Shelly, but I love 2011! Love it Shelly!! You are super talented! There’s little chance I could pick a favorite because I really like each one. 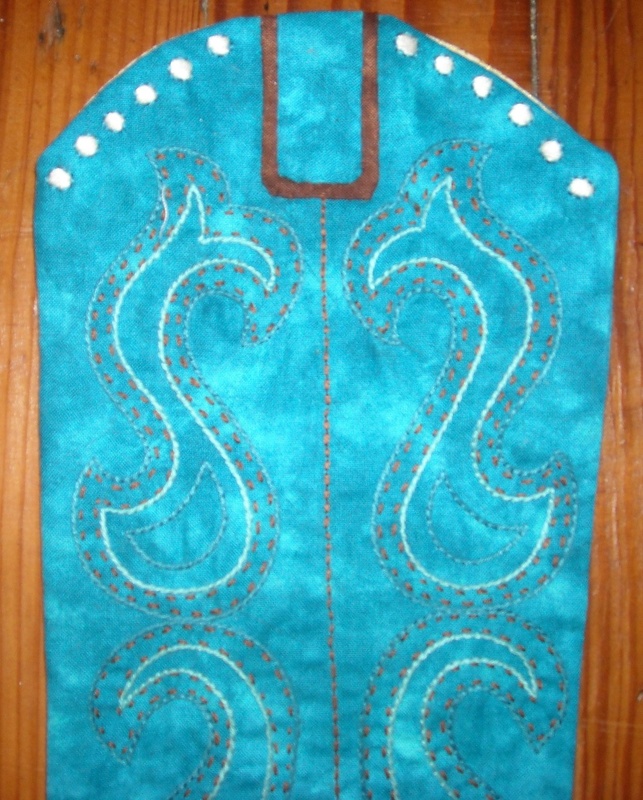 That said, this one is probably inching ahead of the others since I am partial to embroidery. I love them all you are so talented. Love the color of this one. Thanks for the giveaway. I love the 2013 stocking. It would look wonderful on my mantel. Prairie Star is my fav, though I love the colour of this years. 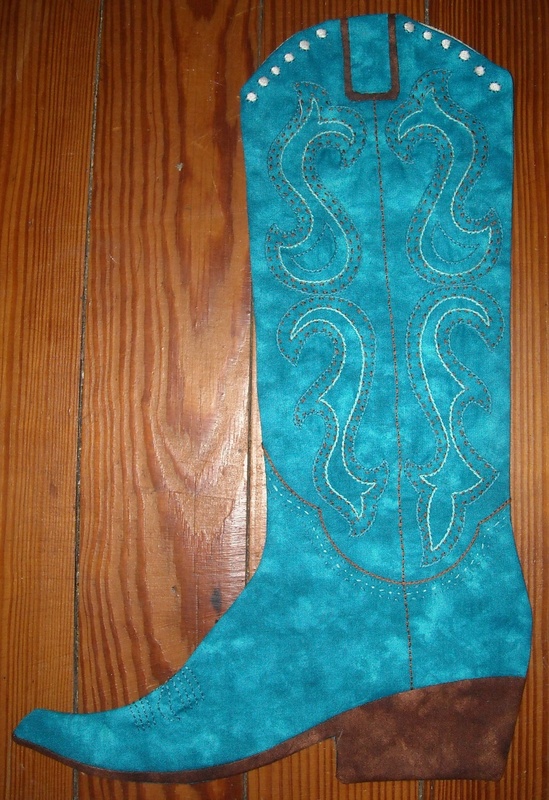 my real boots have a soft brown foot and the leg is teal. I don’t have a favorite………I love them all. I don’t make them but I sure do love to handle them, sell the kits and patterns, admire them – whatever I get to do to be near them. Hard to choose— but I guess Prairie Paisley would be my first choice. Love the new Christmas boot!!!! I think they are all awesome. Better now show Sarah this, she is still after me to make hers. 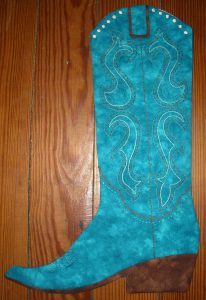 Your Cowgirl boot patterns almost make me wish that I wear boots! I certainly appreciate fancy boots on other people more since I’ve seen your designs. Love them all, but 2010 is hands down favorite. Actually, I think a quilt made of blocks of all of them would be stupendous! Hmmm…. I think 2012 and 2010 are my favorites. Shelly although I am partial to red, I would have to say this years is my favorite now and I love the name. I think you outdo yourself each year. Love the stitching on this one. I would love this pattern to use as a holder for a place setting of silverware.Can it be cut down to size along side of a dinner plate?Thank you for any information you can give me.